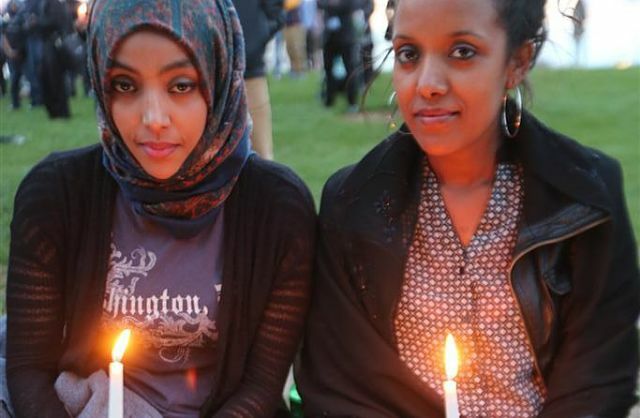 New York (TADIAS) — A candlelight vigil is being held in various Ethiopian Diaspora communities in memory of the 30 people that were recently killed by ISIL militants in Libya. The terrorist network released a video last week showing the gruesome, on-camera execution of Ethiopian migrant workers, most of whom were Christians. In New York a gathering in honor of the victims was held on Tuesday, April 28th at Times Square. In addition, a special prayer service was held on Sunday afternoon at Medhanealem church in the Bronx. Below are photos from a similar gathering held in Washington, D.C. earlier last week on Thursday, April 23rd, which attracted hundreds of people, both Christians and Muslims, who met at the Washington Monument and walked together to the White House.